Pat Phinney, of Piedmont, died January 21, 2017. He was born in Oklahoma City to George and Myrtle (Graves) Phinney. Pat graduated from Central High School in OKC. He was in the Army Reserves post-Vietnam where he flew “Huey” helicopters. In the 1960’s he drove for the Gold Cross Ambulance company. Pat spent most of his career life working in studio production, first for Channel 4 and later retiring from Channel 5 in OKC, where he worked for over 30 years. He was a member of the Piedmont Police Department and a volunteer for the Piedmont Fire Department. Pat loved his boat, BMW motorcycle and lake house at Lake Eufaula, he also enjoyed hunting and fishing. 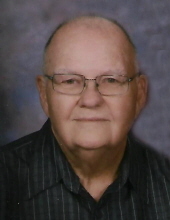 He was a member of the Piedmont United Methodist Church, Kiwanis Club and Elks Lodge in OKC. He was preceded in death by his parents. Pat is survived by his wife of 55 years, Shirley, one daughter; Tamara Westcott and husband Clayton, two sons; Michael Phinney and wife Darla and Kevin Phinney, seven grandchildren; James Andrews and wife Lacey, April Bakke-Mitto, Cody Westcott, Kade McAlvain, Kayla Phinney, Conner Phinney and Colton Phinney. As well as four great-grandchildren; Emma, Alyssa, Amelia and Sam. Funeral Services will be 2:00pm, Thursday January 26, 2017 at the Piedmont United Methodist Church, Piedmont, OK with burial to follow at Chapel Hill Memorial Gardens, Oklahoma City, Oklahoma. To send flowers or a remembrance gift to the family of Pat Phinney, please visit our Tribute Store. "Email Address" would like to share the life celebration of Pat Phinney. Click on the "link" to go to share a favorite memory or leave a condolence message for the family.